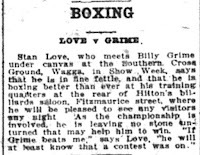 Many publications printed by groups of businessmen over the years, have presented Wagga Wagga as a stolid, staid and stuffy town. 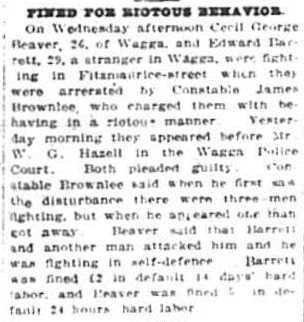 Despite this attempted gloss, the early history of Wagga Wagga turns up many gems, and the early 1920s was particularly rich in surprising events. 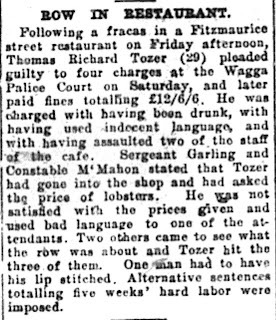 Fitzmaurice Street in the early 1920s was a lively place, with the top four infringements people were charged with appearing to be as follows: Offensive behaviour, Riotous behaviour, Indecent language, and Loitering. 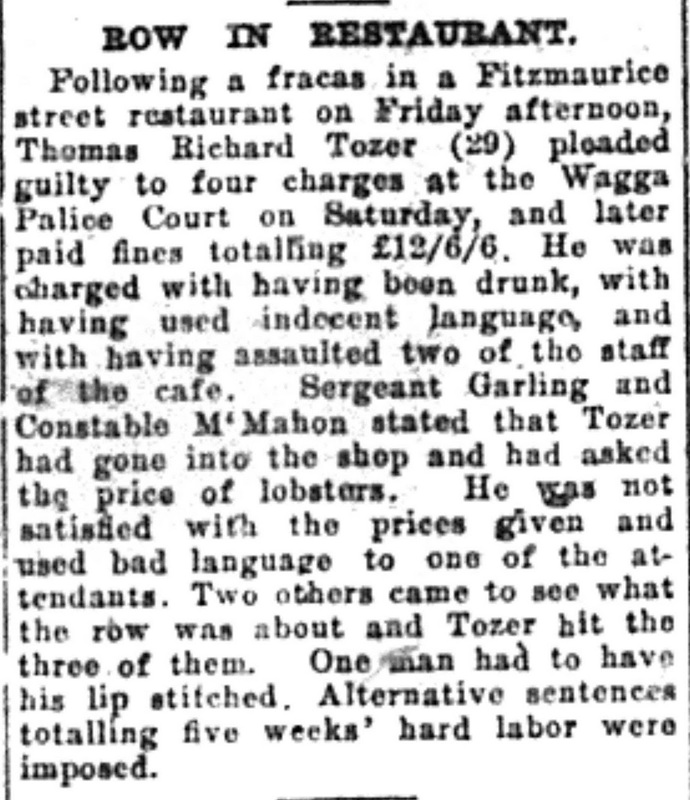 Of these, riotous behaviour was the most popular, often involving drunken brawls, and other alcohol fuelled behaviours that were puzzling to hapless bystanders. 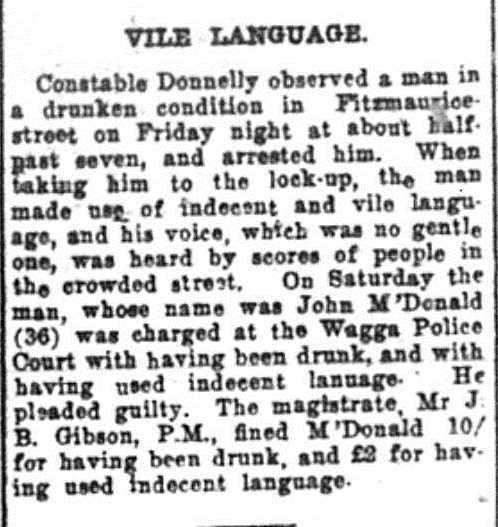 Indecent language was also popular in 1920s Wagga, with the actual language or words used described in very decorous and demure terms that gave no hint of the content, but the people of the time must have known what swear words of the day were most frequently used. 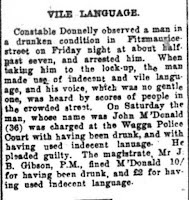 Again it was mostly alcohol affected people loudly disclaiming near a convenient policeman on street patrol, with hopefully a group of suitably shocked persons witnessing the “crime”. 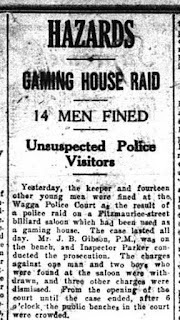 Offensive behaviour was prevalent, though again, descriptions given were mild in comparison to today’s standards, and thumbing your nose at a policeman could get you arrested. 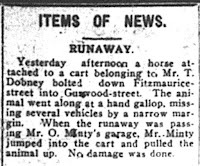 The other startling statistic from this time is the high number of traffic accidents, involving bolting horses, runaway horse and buggies, and car and motorbike accidents. 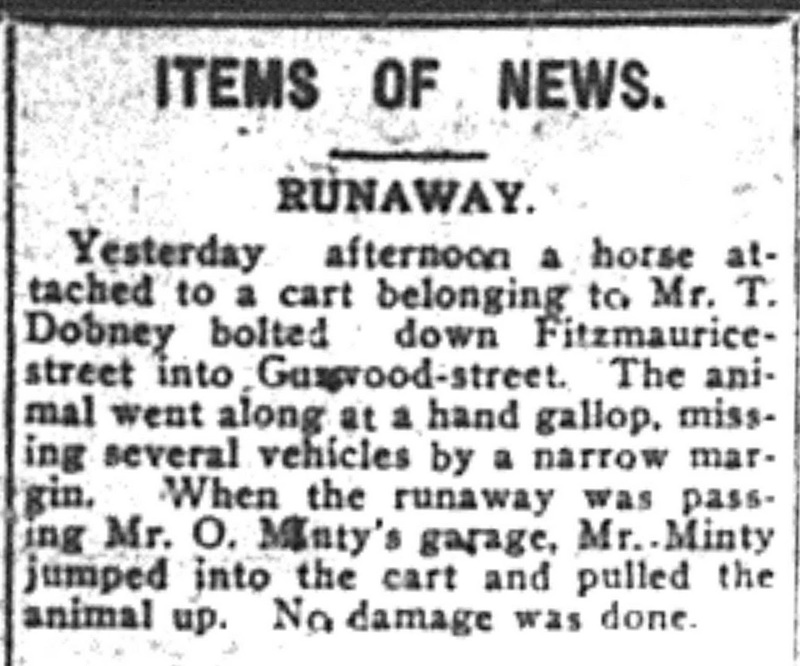 Men of this time were used to performing great acts of derring do, leaping into runaway carts and pulling up the horse and saving the occupants of the cart or buggy. 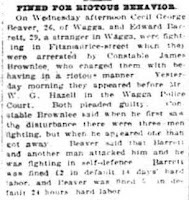 Men would do this at a moment’s notice so it must have been a fairly common occurrence to be that prepared and confident to stop a bolting horse. 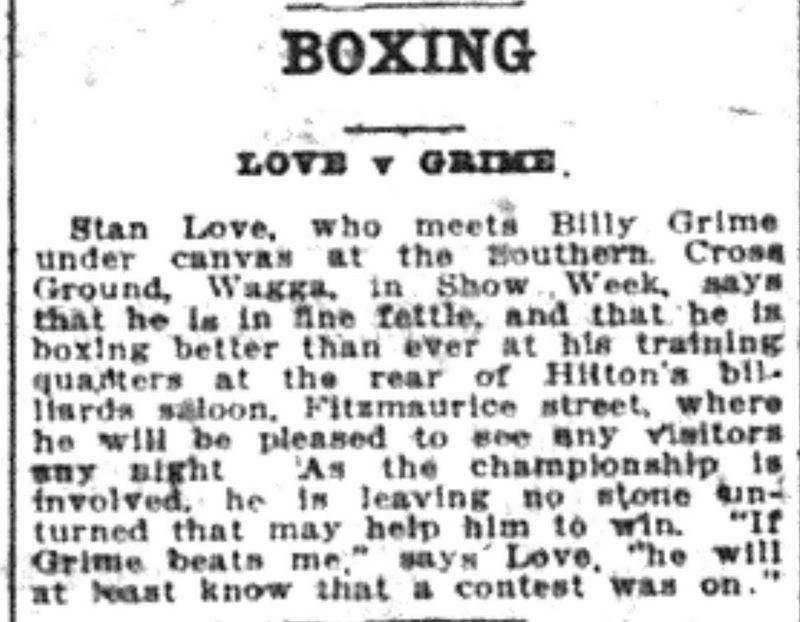 Mr Minty, of Minty’s garage fame, made it into the Daily Advertiser as one of many men who rescued people this way. 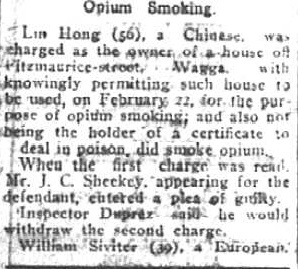 Opium smoking was a social problem of the time, generally inhabitants of the town knew where the opium dens or smoking establishments were, and of course illegal gambling was huge at the time along with other less troubling entertainments. 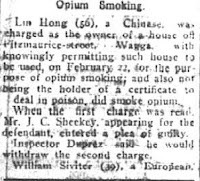 Unconscious people were often found lying in the street, sometimes outside opium dens, or pubs. 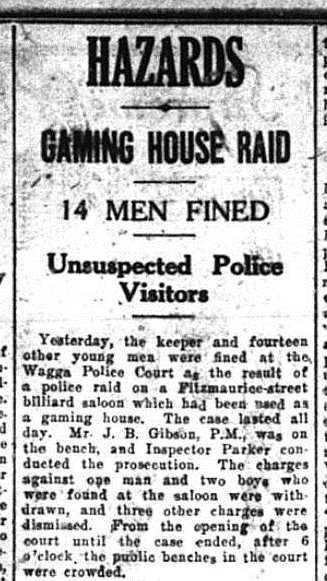 The gaming house was shut down, as were the opium dens (eventually). 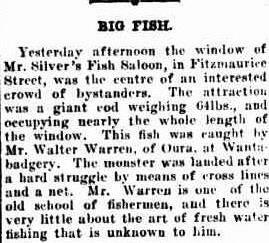 But the best of all these stories are the oddities of Fitzmaurice Street.